Welcome! You've reached the "About Us" page of The Online Photographer (a.k.a. TOP). TOP is a daily news website for photo enthusiasts, in blog format. Our past contributors number more than 50 writers, including professional photographers, several photography magazine veterans, and writers from other fields who have a special interest in photography. Our mission: to help connect today's photo enthusiasts to photography's culture: its tradition, history, industries, best practices, accomplishments, literature, theory, legal issues, and current events. ...lead directly to the weblog page. If you need the "naked URL" of the weblog page for any reason, please click on any of the three links above and scroll and copy the address from your browser's address bar. Any time the top post on the weblog doesn't interest you, don't worry. It changes all the time. You are allowed to skip. Since its founding in November 2005, TOP has become one of the most popular "small" photography sites on the Web. It's edited and organized by veteran photo magazine writer and editor Mike Johnston (that's me in the little picture, in 2006). After a year and five months on Blogger (accessible through the link "The Old Site" under "Resources" in the right-hand column), version 2.0 was launched on TypePad on Monday, June 4th, 2007. The site is supported by advertising, direct subscription, and affiliations to Amazon (in the U.S., U.K., Germany, and Canada), B&H Photo, and Adorama Camera. Want to advertise? Go here. Want to support the site? You can, by subscribing. TOP was founded so photographers from around the world would have a place where they are assured of finding new content every day. We publish about 360 days a year and average 2.5 posts per day. We cover anything and everything of interest to practicing photographers. Our focus is more on art and accomplishment and less on technique and equipment than many of the largest sites, but we do cover gear and technical issues as well as artists, photojournalism, shows, and people. What can you find on TOP? "...And a lot more," as they say. And when we say it, we're not kidding. Readers feel that the main strength of TOP is its great variety. Don't like something you read? Scroll down, wait for tomorrow—there's always something different coming up soon, or easily accessible in the archives. We welcome everyone who has an interest in photography. We have readers in more than 55 different countries altogether, including Iceland, Belize, Bermuda, Bahrain, Great Britain, Uruguay, Malaysia, Australia, Pakistan, and Bali. Here's the approximate geographic breakdown of our audience: 45% from the U.S., 60% from North America, 90% from English speaking countries, and 10% from the rest of the world. Average traffic: hits on the main page currently range from about 28,000 to 35,000 per day on weekdays, including readers who subscribe by feeds, and about 2/3rds that on weekend days. Best traffic day: 73,000+ visitors, including by feed. Best traffic month: 740,000+ visits not counting feed readers. Our audience is wide-ranging and eclectic. We are used as a student resource in several college-level photography programs and courses, and are fortunate to have among our readers some world-renowned art photographers and high-level, world-famous pros. Most of our readers, naturally, are hobbyists and passionate amateurs. We have more women photographers among our readers than some of the more "techie" sites do. All comments are moderated so there are never any unpleasant "flame wars." There's one cardinal rule for comments: "No ad hominem." (Translation, in case you don't speak Latin: no insults, please.) You can read more about comments policy at our Comment Guidelines page. T.O.P. was recently named by National Geographic Traveler (on nationalgeographic.com) as "one of the best places to learn about photography on the web." "My favorite website," said Dan Westergren, Picture Editor for National Geographic Traveler, "where you can find discussions on all aspects of photography." 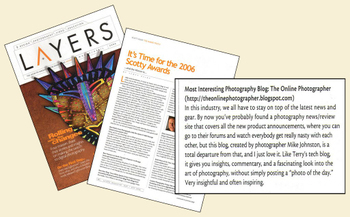 Internationally famous Photoshop guru Scott Kelby, Editor-in-Chief of Layers magazine, awarded TOP his 2006 "Scotty" as "Most Interesting Photography Blog." So come on in and have a look around. If you enjoy photography—especially if you enjoy it a little too much—chances are you'll enjoy The Online Photographer. Thanks for stopping by—and, once again, welcome!